From Universal Remote to Universal Game Controller? You've heard of universal remotes, but what about universal game controllers? Universal remotes let you control different brands of consumer electronics, primarily television sets, using a single button-smothered controller. They've been around since the mid-1980s, a late reaction to the VCR invasion, with an eye toward the multi-rack-module "entertainment center" we take for granted today. But universal remotes work primarily as a way to consolidate TV sets, satellite receivers, and video recording or playback devices, not video game systems. And you can already buy third-party game controllers that offer cross-platform functionality. Microsoft's USB-based Xbox 360 gamepad, for instance, which transits comfortably between an Xbox 360 and USB-capable Windows PC. Now imagine a generic device that worked "universally" with your PlayStation, Xbox, PC, or even a Wii. Would you buy such a gizmo? Sony thinks you might, or at least that's my take-away from a US patent and trademark app the company filed recently for a very specific sort of controller designed to work with just about any console, from recent models to legacy ones. 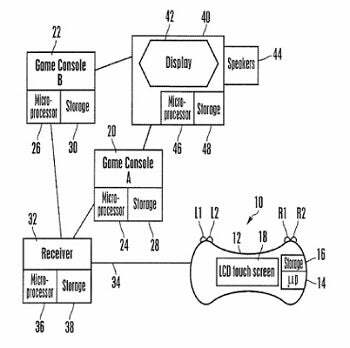 According to United States Patent Application 20100041480, Sony's dreamt up "a universal game console controller that has an LCD presenting, depending on what type of game console a user has input, a controller key layout for a first type of game console or a controller key layout for a second type of game console." The device would also include an integrated speaker, vibration feedback, onboard storage, various gamepad-like buttons, an option to ape an alphanumeric keypad, and another to emulate older game consoles. Older consoles? Really older consoles. Specific models named include the Amiga CD-32, Atari Jaguar, and Turbographics, as well as general controllers made by Nintendo, Microsoft, and Sega. The patent even singles out the Gravis Gamepad, a PC-based controller that mimicked the Super Nintendo Entertainment System's controller. Make of that what you will. "Just like remote controls, game consoles, and thus game controllers, are becoming widespread," reads the 'background' section of the patent filing. "It is not surprising to find more than one game consoles in a household, especially when competing game console manufacturers attempt to attract unconventional consumer groups in the gaming industry." "As understood herein," concludes Sony, "it would be useful to have a universal controller that would be able to work with a variety of game consoles. Useful? Or with all the control nuances part and parcel of interactive gaming, prohibitively generic?